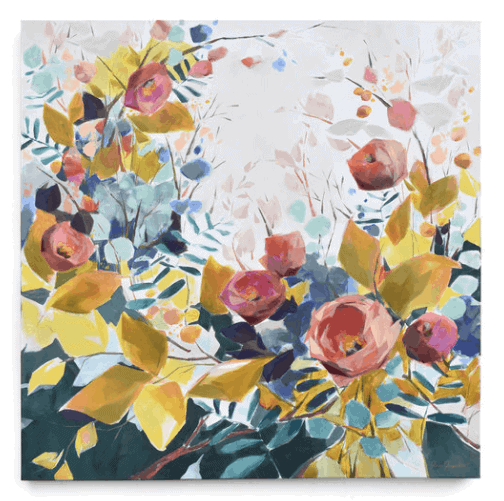 Jess Franks, Floral & Landscape Artist and Instagram Sensation — and a Giveaway! I am so pleased to bring you today’s post! I’ve become a bit of an art monger in recent years, and one artist who has caught my eye (along with an enormous following on Instagram) is Jess Franks. Stick around to the end of the post for a nifty little giveaway! I’m not usually attracted to art that is completely literal, nor to the purely abstract. I tend to be struck by pieces that are more expressionist or representational in nature and with deep and complex colors. 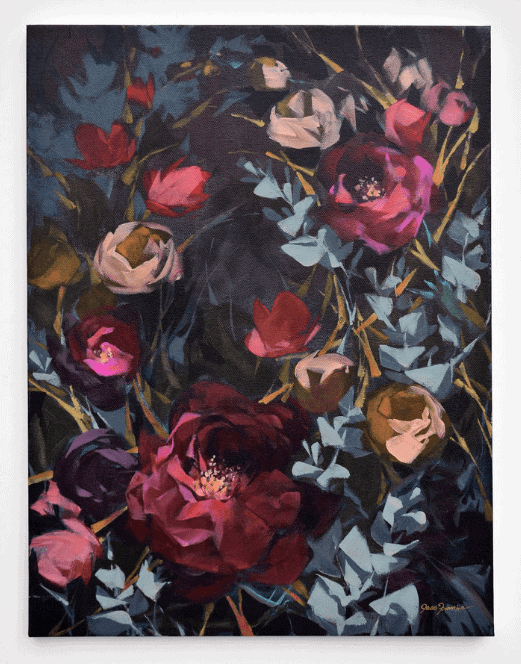 I’m moved by sheer beauty, too, which is probably why Jess’s florals and landscapes appeal to me (and so many others) — the things she represents are familiar and comfortable and yet feel slightly other-worldly or heightened, like she’s trying to get at their vibrant essence. Anywho! That’s my deep thought for the day! I’m no art critic. If she’s an awesome artist, Jess is an even more wonderful person. From her IG posts, I vaguely knew that she and her husband were going through the adoption process in January, but in talking to her I learned that they have adopted ALL FOUR of their children. Wow. That’s humbling. Let’s get to know her and her work. You might end up having a crush, just like I do. Amy: Let’s put your art on the back burner for a moment and tell me about your family. You have four adopted children? Jess: Yes. My husband and I both came from larger families. We were really united and passionate about choosing adoption and just felt, “why not give kids already in the world a family?” We started our first adoption the year after we were married. For the last two years, my work has been able to financially support the adoption process for our family, which is very gratifying. Now we have 4 children. Amy: You didn’t train as an artist but as a graphic designer. How and when did you make the switch? Jess: I’ve loved art for forever. In fact, both my grandmother and my great-grandmother were skilled amateur artists. I vividly remember growing up and being in my grandma’s art studio and doing watercolor with her. However, I’ve also always been deeply pragmatic, and I felt I needed to get a college degree in something I could make a living at. So I majored in publishing with an art minor. I spent 10 years in art direction for various magazines, and then, when we got married and started a family, spent another 6 years freelancing in graphic design. I only just stopped my freelance graphic design work this past January! 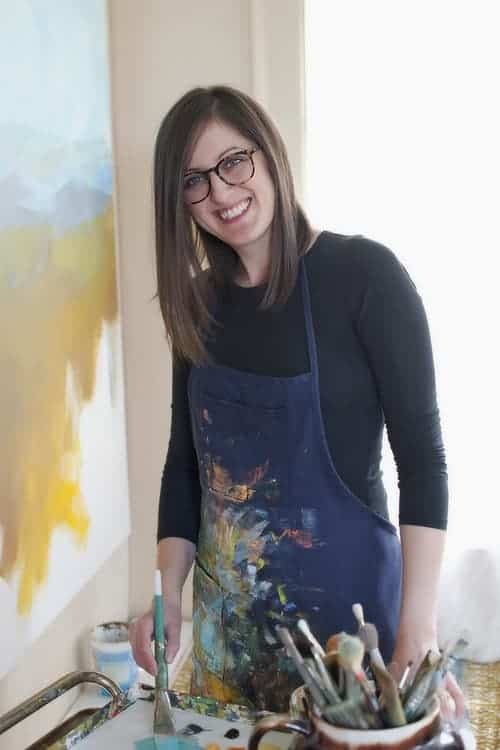 Jess: The impetus for painting was a few years ago when my husband took a teaching job at a private school and my son started attending there. Prior to that, our kids were home schooled. My husband was really encouraging, so I took a few painting classes. After I took some lessons, I started posting my painting on Instagram, and people kept following and began asking me to sell my work. So I started a shop on Etsy, and one step led to another. But I wouldn’t have changed the path I took. Magazines gave me an eye for how to compose art and how to sell art. I feel my work is so much better because I had so many years of ideas building up inside me. When I finally picked up a paintbrush, everything just clicked. My husband has been so supportive through all of this. But the funny thing is that his favorite color is gray! Color is just not in his soul. He’s ex-military, loves wearing a uniform, etc…..
Amy: You grew up in Granby, CT (right next to my hometown of Simsbury!!! ), which you’ve called your own little “Star’s Hollow.” (Men — if by some chance there are any men are reading this design blog — it’s a Gilmore Girls thing.) Does where you live influence your work? Jess: Absolutely. I was a typical home schooled kid — reading all the time, outside all the time, creating all the time. I became enamored with C.S. Lewis and J.R.R. Tolkien when I was in my 20s. Amy: No way! I think I know a little too much about The Lord of the Rings for most people’s comfort! I completely killed a sister’s junior year finals by giving her the trilogy the week before the end of the year. Jess: I know! They introduced me into these worlds that I could never have conceived, so different and yet also so familiar. It gave me brain explosion and a whole new way of looking at the world around me. In the same way, my painting is sort of literal and sort of not. I think that’s why my art resonates with so many people — it’s accessible and yet definitely presents a new way of seeing the same old things. People like how it straddles that line. Amy: I love that you still offer your original paintings on your website! 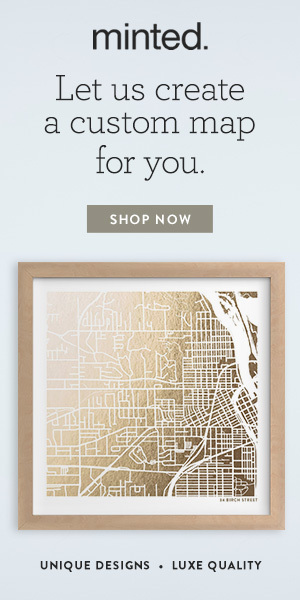 But you also have prints that are really popular on Minted, and a new work for West Elm. Tell me how you got started with Minted. Jess: The pieces on Minted have usually won one of its contests, and each of these contests usually has between 5,000-7,000 entrants. I entered my first contest a few years ago and didn’t place. Then Minted partnered with Domino, and I got 3rd in that one. I kept entering, and got a 2nd place finish in contest with Minted and West Elm. Then, finally, I was the 1st place winner in another West Elm/Minted collaboration. Minted is super supportive of its community of artists and has given me access to a huge, broad audience. It has definitely helped feed my Instagram presence. Jess’s offerings for Minted below! Amy: On your IG feed, you posted 12 paintings, 3 of which you were going to choose to become NEW prints. Have you decided which ones? Jess: Actually, the response was so enormous that all 12 will be available on my website, probably in mid September after the kids are back in school and I can get my ducks in a row. I’m so excited; I just received the strike-offs, and they are gorgeous! You can see the texture of the canvas through the color. These will be mostly 18″ x 24″ high-quality giclées, but I want people to be able to afford art, so these will be at a very reasonable price point for the quality. Amy: I love the lady with the flowers coming out of her head! I wanted to buy her when you posted the original on your feed, but alas… the funds…. Super excited I can get a second chance! Jess: I painted her when we were in the process of adopting our daughters. I was thinking about what it meant to be the mother of a daughter. Society places such an importance on appearance and how you look. I wanted to communicate to her that what was most important was not what others thought of her, but of what she thought — the creations of her mind and heart. Amy: I read on your website that you will be taking commissions, starting in the fall. As an interior decorator, I find that news very exciting! Jess: Yes, I finally have my own studio space up in the attic, a place without having the family all up in my stuff! (Jess laughs again.) Regular painting — I can do that more on a whim, follow where the paint takes me. Commissions — for that process, giving a client what she wants, I need extra brain space to plan ahead. It takes a greater level of time and focus for me. Amy: You have a new calendar out. Is that something being produced by Minted, or are you doing that yourself? Jess: I produced this on my own with a local printer. I think it’s a natural outgrowth of my graphic design background. I wanted an even more affordable way for people to access my art. Though these are not “art prints,” per se, each page has perforations at the top and bottom of the artwork, so that once a month is complete, you can easily remove and frame the 8”x10” print. They are already more than half sold out! Calendars will be ready to ship at the end of August. Amy: Anything you’d like to add for the benefit of your completely rapt Saturday Blog audience? Jess: Well … this art thing has been such an unexpected twist in my life. I guess I’d say to people, there are so many aspects and life experiences that make up each person. You never know how all those things can be taken together and used to a greater purpose. We shouldn’t regret certain decisions made out of practicality or necessity, because they can come together for things you never imagined. And now … for the GIVEAWAY!!! While I would love to offer an original painting, neither Jess nor I can afford to sponsor anything that big. Hope I didn’t get your hopes up! To enter, you have to be a subscriber — so if you haven’t, go ahead and subscribe in the right hand sidebar just below my singer-days glamor shot. Then, for all you subscribers, comment with how wonderful you think Jess’s art is and/or how much you love Home Glow’s Saturday Blog for a chance to win. If you feel so moved, share on Facebook and urge YOUR FRIENDS to subscribe! You have until 5 PM EST on Friday, August 11 to do it. Winner will be announced in next Saturday’s post! You’ll be supporting an inspirational working-artist and a working designer/writer/still-home-with-kids-and-crazy-mom. Spread the word! See you next week! This post contains some affiliate links. All topics, opinions, and product choices are my own. Ditto on the wish list calendar. Lovely artwork, and it’s always nice to know something about the artist.